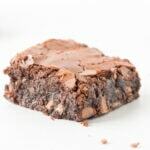 Making fudgy and gooey eggless brownies could not be any easier, using almond flour and stevia! These paleo and vegan brownies are the ultimate low carb and keto dessert, but you’d never be able to tell! Keto brownies with almond flour will result in gooey, fudgy and moist brownies, perfect to satisfy any sweet tooth out there. 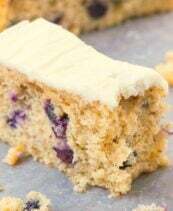 Using almond flour provides a light exterior, moist interior and fudgy in texture. I often get asked if brownies can be made with almond flour, especially with so many keto brownie recipes calling for coconut flour. The answer? Absolutely, and you’ll be left with a delicious eggless brownie! What is almond flour made from? As the name suggests, almond flour is made from ground up almonds. 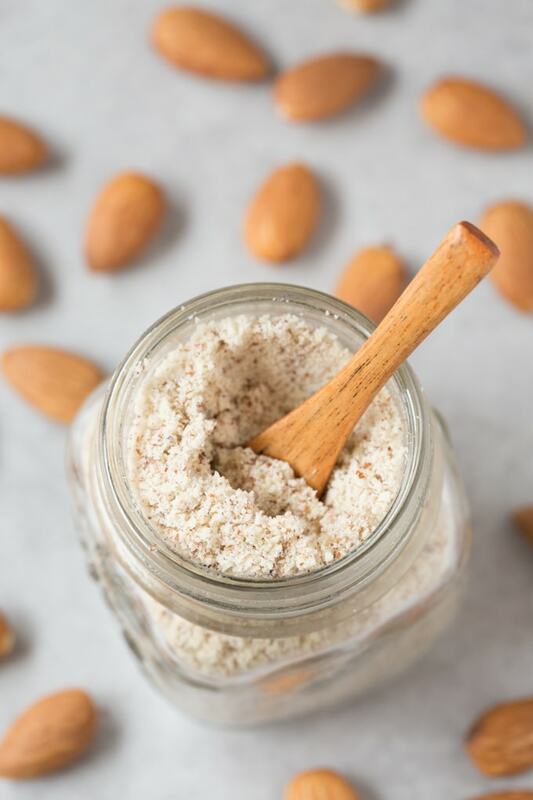 The almonds are ground into a fine texture, with several varieties out there- Blanched almond flour, super fine almond flour, and almond meal. While all essentially the same thing, they have different textures and different flavor notes. Blanched almond flour is super fine in texture and very light in color, as the skins have been removed before grinding. Superfine almond flour has the same consistency of blanched almond flour, but only with the skins on. Almond meal, on the other hand, is ground almonds with the skin on, but with a less fine texture. Can you sub almond flour for almond meal? 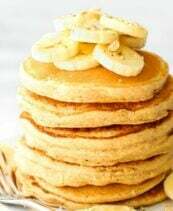 While you can use either blanched almond flour or superfine almond flour for this recipe, I don’t recommend using almond meal instead. If you use almond meal, you’ll find the texture of the brownies to be more gritty than gooey, and a little denser. Step 1: Preheat the oven to 175C/350F. Line a loaf pan (I used 8.5 x 4) with parchment paper and set aside. Step 2: In a small mixing bowl, combine your ground flaxseed with water and let sit for 15 minutes, for a gel to form. Step 3: In a large mixing bowl, combine your almond flour, cocoa powder, baking powder, and baking stevia and mix well. 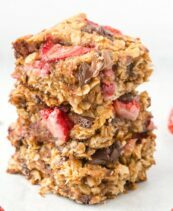 In a seperate small bowl, add your flax egg, sunflower seed butter, and vanilla extract and mix until combined. Step 4: Combine your dry and wet ingredients, and mix until smooth and fully incorporated. Fold in your chocolate chips. Step 5: Transfer to the loaf pan and spread out using a rubber spatula. Bake for 35-40 minutes, until the edges are brown and a skewer comes out ‘just clean’ from the center. Allow brownies to cool in the pan completely, before slicing into pieces. These almond flour brownies are made without eggs and without butter, so aren’t recommended to be kept at room temperature. Leftover brownies should be stored in the fridge in a sealed container. Brownies will keep well for at least 5 days. 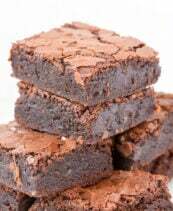 Brownies are also freezer friendly and can be kept frozen for at least 2 months. Ensure brownies are wrapped in parchment paper and sealed in a container or ziplock bag. Enjoy brownies by thawing out at room temperature. These paleo almond flour brownies are made without eggs, so even removing them from the oven a little early is okay. Brownies will continue to firm up once cooling at room temperature. Oven temperature is just an estimation- Start checking around the 35-minute mark, then in 2-minute increments. 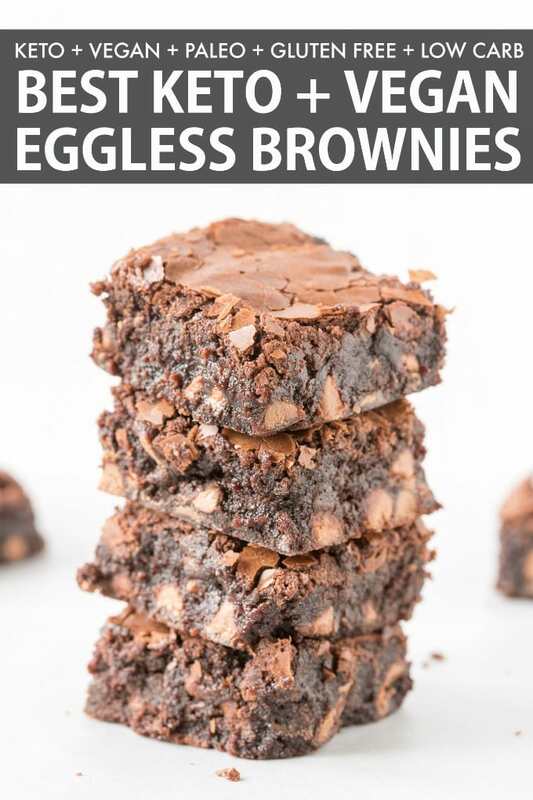 As these are eggless brownies, they won’t rise. Using a loaf pan ensures the brownies are thick. If you prefer thin brownies, use a square pan. I’ve only experimented with these using flax eggs as the egg substitute. I cannot vouch for chia eggs or other vegan alternatives. You can substitute the sunflower seed butter for almond butter or peanut butter. 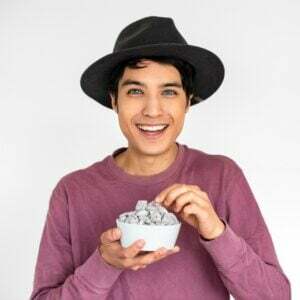 Avoid using peanut butter if you follow a paleo diet. If you use extra chocolate chips, adjust the cooking time for 2-3 extra minutes. Even an extra tablespoon or two will require a difference in the cooking time. The BEST Keto and Low Carb Brownies ever, made with almond flour and stevia! 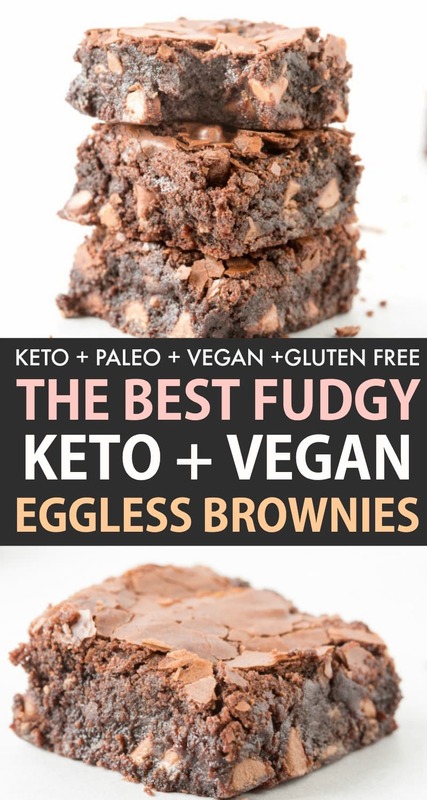 No eggs are needed to make these gooey and fudgy brownies, vegan, paleo and gluten free. In a small mixing bowl, add your ground flaxseed with water and allow to sit for 15 minutes, to gel. Preheat the oven to 180C/350F. Line a loaf pan (8 1/2 x 4) with parchment paper and set aside. In a large mixing bowl, combine your dry ingredients and mix well. In a seperate mixing bowl, add your flax 'egg', sunflower seed butter and vanilla extract and mix well. Combine your wet and dry ingredients and mix very well. Fold in your chocolate chips. Transfer to the lined pan and spread out using a spatula. Bake for 35-40 minutes, or until the edges have crisped up and a skewer comes out the center 'just' clean. Allow brownies to cool in the pan until completely cooled, before slicing. Paleo Vegan Almond Flour Brownies (Keto, Low Carb) should be stored in the fridge in a sealed container. Brownies will stay fresh for at least 5 days. Brownies are freezer friendly and will stay fresh frozen for up to 2 months. Brownies loosely adapted from Coles Magazine, 2018, May issue (467). How can I actually use eggs in this? The rest of the ingredients would be perfect for me. Hi there, I haven’t tried with eggs- If you do, I’d see how the equivalent would be compared to flax eggs- So 4 eggs! It says 1 1/2 cups of any granulated sweeetner, what did you use? 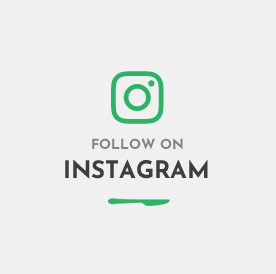 I used monk fruit in the raw 🙂 I’ve linked to it! I like walnuts in brownies…would 2 tablespoons of chopped walnuts be too much? Amazing! Its been 10 days since I started my finicky eating boyfriend on a strict keto diet. He deserved a reward so I made your brownies. I cooked them 35 minutes. The sides were crunchy and done, but the rest was still very wet. My toothpick(s) came out batter drenched. Internally I was freaking out, but it just couldn’t go wrong! Sure enough, as it cooled it firmed up perfectly. They are absolutely delicious! You’d never guess the ingredients. 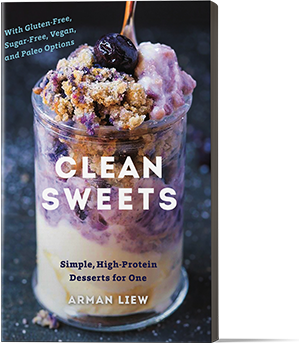 Arman, I’m excited to try many more of your recipes. Very impressive. Karen! That mean sso much and I’m so glad to have you here! Following the recipe as stated, the sugar substitute I used produced it, along with the mix of chocolate chips. I can’t vouch for other sweeteners. 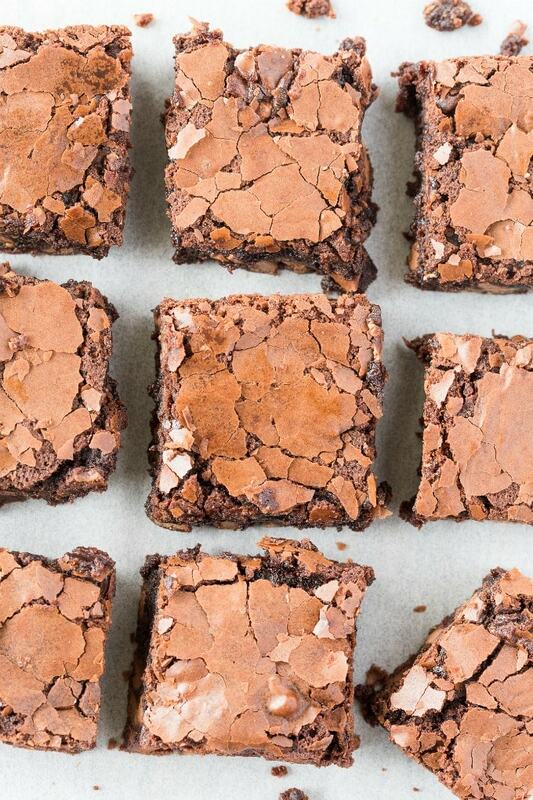 That crackly crust in a sugar free brownie is outrageous. What is the texture of your monkfruit sweetener like? I have a bag of stevia in the raw that substitutes cup-for-cup with sugar, and it’s powdered sugar texture. Is that what the one you linked to is like? My favorite healthy brownie, HANDS DOWN. My hubs noticed I had been eyeing it, so he buckled down to made me this goody. He replaced 1 cup of the sweetener with 1 cup date sugar, used tahini instead of sunflower seed butter, omitted the baking powder (for my bone health), nixed the optional chocolate chips, and baked it in the loaf pan. It had that beautiful, deep cocoa flavor I love in a brownie. Thank you so much for the great recipes you delight everyone with!